Katona Gábor, Ambrus Rita, Csóka Ildikó, Szabóné Révész Piroska: Monoklonális antitest tartalmú termékek fejlesztésének szempontjai az előállítástól a készítmények formulálásáig – GYOGAI. 61.579-587 2017. 1. Strebhardt, K., Ullrich, A.: Nat. Rev. Cancer. 8, 473-480 (2008). 2. Keith, J., Bell, G. T.: J. Immunol. Methods. 100, 5-40 (1987). 3. Riechmann, L., Clark, M., Waldmann, H., Winter, G.: Nature. 332, 323-327 (1988). 4. Tyagi, S., Sharma, P. K., Kumar, N., Visht, S.: Int. J. Pharmtech. Res. 3, 459-463 (2011). 5. Pandey, S.: Hybridoma, 1, 17 (2010). 7. Deantonio, C., Cotella, D., Macor, P., Santoro, C., Sblattero, D.: Phage display technology for human monoclonal antibodies. Human Monoclonal Antibodies: Methods and Protocols, 277-295 (2014). 8. Moorthy, B. S., Xie, B., Moussa, E. M., Iyer, L. K., Chandrasekhar, S., Panchal, J. P., Topp, E. M.: Structure of monoclonal antibodies. Biobetters. Springer New York 81-89 (2015). 11. 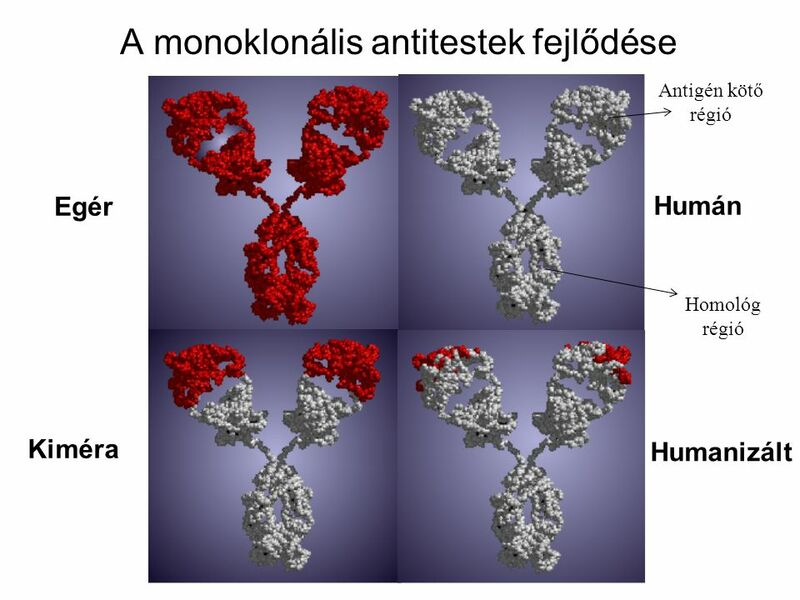 General policies for monoclonal antibodies. World Health Organization. 2009-12-18. 14. Lowe, D., Dudgeon, K., Rouet, R., Schofield, P., Jermutus, L., Christ, D.: Adv. Protein. Chem. Struct. Biol. 84, 41-61 (2011). 15. Folzer, E., Diepold, K., Bomans, K., Finkler, C., Schmidt, R., Bulau, P., Koulov, A. V.: J. Pharm. Sci. 104(9), 2824-2831 (2015). 16. Pace, A. L., Wong, R. L., Zhang, Y. T., Kao, Y. H., & Wang, Y. J.: J. Pharm. Sci. 102, 1712-1723 (2013). 17. Vlasak, J., Ionescu, R.: Taylor & Francis MAbs 3, 253-263 (2011). 18. Sangshetti, J. N., Deshpande, M., Zaheer, Z., Shinde, D. B., Arote, R.: Quality by design approach: Regulatory need. Arab. J. Chem. (2014). 19. Jiang, C., Flansburg, L., Ghose, S., Jorjorian, P., Shukla, A. A.: Biotechnol. Bioeng. 107, 985-997 (2010). 20. Jorgensen, L, Nielsen H. M.: Delivery Technologies for Biopharmaceuticals (peptides, proteins, nucleic acids and vaccines). John Wiley and Sons, (2010). 21. Kerwin, B. A.: J. Pharm. Sci. 97, 2924-2935 (2008). 22. Sousa, R.: Acta. Cryst. D. 51, 271-277 (1995). 23. Arakawa, T., Ejima, D., Tsumoto, K., Obeyama, N., Tanaka, Y., Kita, Y., Timasheff, S. N.: Biophys. Chem. 127, 1-8 (2007). 25. Pramanick, S., Singodia, D., Chandel, V.: Pharma Times, 45, 65-77 (2013). 27. Tebbey, P. W., Varga, A., Naill, M., Clewel, J., Venema, J.: Taylor and Francis MAbs 7, 805-811 (2015). 28. Nilanjana D.: Biopharm. Int. 29, 47-52 (2016). 29. Amstead, A. L., Li, B.: Int. J. Nanomed. 6, 3281-3293 (2011). 30. Lencer, W. I., Blumberg, R.S. : Trends. Cell. Biol. 15, 5 –9 (2005). 31. Walsh, S., Kokai-Kun, J., Shah, A., Mond, J.: Pharm. Res. 21, 1770– 1775 (2004). Csóka Ildikó: Az oktatás minőségbiztosítási aspektusai I. rész – GYOGAI. 61. 588-597. 2017. Csóka I.: Quality aspects of education Part I. The article evaluates the quality culture and measures, in case of two levels of educational system (public and higher education) based on the dual definition of quality (1. natural meaning: conformance to requirements, 2. quality as an individual matter, products that best satisfy the preferences). After introduction of the general basic terms and methods in quality management (PDCA cycle, Shiba – 4 levels of quality); the work adapts these to the systems and processes present in these educational levels. Some basic elements of quality culture in public education and also the „Standards and Guidelines for Quality Assurance in the European Higher Education Area” are presented in order to give an overview on the present practice at national and international levels as well. Parameters affecting the quality of educational process are summarized by means of Ishikawa or cause - effect diagram; and a final summary on the future mission of higher education is presented also. Kovács Erzsébet: Atopiás dermatitis kezelésének kérdései a gyógyszerészi gyakorlatban – GYOGAI. 61. 598-602 2017. 1., Atopiás Dermatitis, Egészségügyi Minisztérium szakmai protokollja (L2090). A Bőr- és Nemibetegségek Szakmai Kollégium, 2008. 2. Kontakt provokáló faktorok szerepe felnőttkori atópiás dermatitisben Doktori értekezés, dr. Pónyai Györgyi, Semmelweis Egyetem Klinikai Orvostudományok Doktori Iskola, 2009. Although in the last few years have seen important improvement in the understanding of the pathoetiology of AD and consequently has been introduced some new options of therapy, the key factor of treatment remains the appropriate daily care targeting the barrier repair. Taking into account the inflammatory nature of the skin symptoms (pruritus, skin hyperreactivity), topical corticosteroids have always been the cornerstone of the treatment of AD Appropriate use of topical corticosteroids is characterized by a high efficacy, with reduced disease relapsing, and by a low incidence of local and systemic side effects. Duration of their use should be limited as short as possible. To the successful treatment of AD’s symptoms, the cooperation of experts of various medical disciplines is needed, preferring individual treatment. Among the knowledge of pharmacists has a significant importance. Benkő Ria, Soós Gyöngyvér: Ajánlások lokális kortikoszteroid készítmények orvosi vényre történő expediálása esetén – GYOGAI 61. 603-606 2017. 1. Kárpáti S., Kemény L., Remenyik É.: Bőrgyógyászat és venerológia. Medicina, Budapest 2013. 5. Tan X, Feldman SR, Chang J, Balkrishnan R.: Topical drug delivery systems in dermatology: a review of patient adherence issues. Expert Opin Drug Deliv. 9(10), 1263–71 (2012). Clauder Katalin: Visszapillantás szeretett Édesapámra – GYOGAI 61. 607-612. 2017. Azt szeretném, hogy azt mondják: „Megéri MGYT tagnak lenni” – Interjú Horváth Lászlóval, a Társaság főtitkárával – GYOGAI 61. 613-616. 2017.